Pittsburgh City Hall is located at 414 Grant Street, Pittsburgh PA 15219; phone: 412-255-2626. Photo: Sellers House, ca. 1858, 400 Shady Avenue, Pittsburgh, PA Listed on the National Register of Historic Places in 1979. Photographed by user:Lee Paxton (own work), 2009, [cc-by-3.0 (creativecommons.org/licenses/by/3.0)], via Wikimedia Commons, accessed May, 2013. Pittsburgh was founded and named in 1758 and incorporated as a city in 1816. Its boundaries grew numerous times through annexations of surrounding land, with the last annexation occurring in 1955. Millions of years ago, geologic forces laid the groundwork for Pittsburgh's development. The land's subsurface held an abundance of natural resources including oil, coal, natural gas, sand, limestone, shale, metallic minerals, and water. Once discovered, these resources catapulted Pittsburgh's rise as a gateway to the American frontier and a major industrial powerhouse. An ample water supply sustained Native-American tribes over thousands of years. Archaeological data suggests that Paleo-Indians used the Meadowcroft Rock Shelter in present day Washington County 15,000 to 19,000 years ago. Evidence also suggests that the confluence of the Allegheny and Monongahela Rivers served as an exchange site among several related native groups. In the mid-18th century, the armies of France and Great Britain cut trails to Pittsburgh. Military leaders spotted the location where the Allegheny and Monongahela Rivers converge to form the Ohio River and set out to control it for tactical advantage. The rivers served as early transportation routes and the riverfronts offered strategic opportunities for travel, trade, exploration, and power. The French and British vied to control "the Point" where the three rivers meet. Constructed here were Fort Prince George (British, 1754), Fort Duquesne (French, 1754 - 1758), and Fort Pitt (British; 1759 - 1792). Pittsburgh was officially founded and named in 1758 when the British took control of the Point from the French. General John Forbes is credited for naming Pittsburgh after William Pitt, a British statesman. During Pittsburgh's mid to late 18th century Military Period, development was limited to about 20 acres and primarily served the needs of the forts. Today this area is part of Point State Park, which commemorates the strategic and historic significance of the area during the French and Indian War (1754-1763). By the late 1780s, threats of Native American raids and war diminished. The Military Period ended and the Frontier Period began. Settlers from England, Scotland, Ireland, Wales, and Germany arrived by river routes, Native American trails and mountain gaps, and a roadway route from Philadelphia that entered Pittsburgh at Penn Avenue in today's Strip District. Pittsburgh was named the seat of Allegheny County in 1791 and soon became home to numerous civic institutions. Not yet a large city, Pittsburgh was incorporated as a borough in 1794. Pittsburgh's early development pattern followed Colonel John Campbell's 1764 "Plan of Pittsburgh," with modifications made by a subsequent plan prepared in 1784 by George Woods and Thomas Vickroy known as the "Woods Plan" commissioned by John Penn and John Penn, Jr. The Woods Plan oriented lots to the rivers but left a series of small, triangular, and unusually shaped lots in today's Golden Triangle along the south side of Liberty Avenue to accommodate existing streets and buildings and maintain direct routes to the riverfronts. Meanwhile, across the Allegheny River, European settlers developed the town of Allegheny (today's Northside) in a traditional grid-pattern of uniform, rectangular lots. Much of the original lot layout and street patterns remain, perpetually linking the City's current form to its original town planners and designers of the 1700s. In the early 1800s, many businesses in Pittsburgh manufactured iron, brick, and glass using coal and other natural resources extracted from the surrounding landscape. Manufacturing transformed Pittsburgh into a commercial economy poised for industrialism and capitalism. In addition to mill industries and glassworks, commercial enterprises included shipbuilding, salt works, saw and grist mills, powder works, soap making, tanneries, trading companies, shops, taverns, hotels, market houses, and more. The City's population grew to 10,000 by 1816, when Pittsburgh was incorporated as a city. Crossing the rivers was made easier with the use of ferries and the erection of bridges. The Monongahela Bridge (subsequently replaced by Roebling's Smithfield Street Bridge) was the City's first bridge, connecting Downtown to the South Side. As the Downtown became more industrialized, people found it fashionable to live across the rivers. 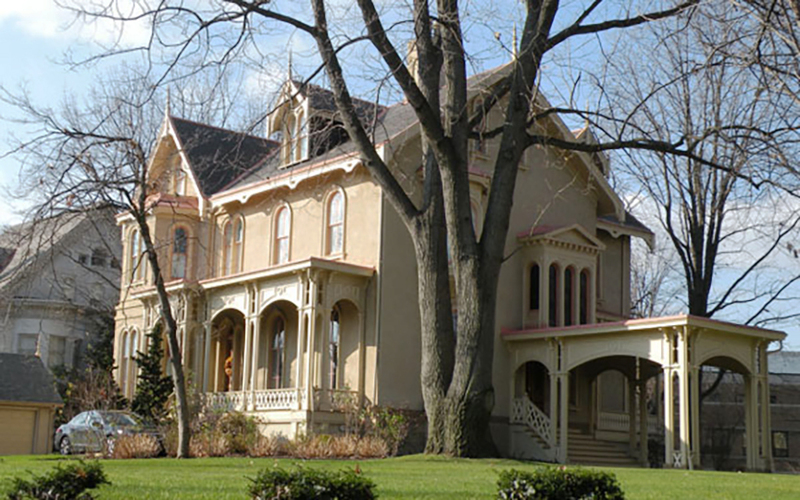 Affluent neighborhoods with impressive architecture developed in the Northside and South Side neighborhoods, which were then towns and boroughs independent of Pittsburgh. Additionally, the West End saw modest development activity, as did Lawrenceville and other neighborhoods. The physical geography of the rivers and hillsides provided separation of developing areas. Each area established a unique neighborhood character and local street system, with streets often not connecting to neighboring communities. The state-owned Pennsylvania Canal was extended to Pittsburgh in the middle 1800s which further spurred commercial development. The Canal stretched from Allegheny (the Northside), across the Allegheny River to the Strip District, tunneled under Grant's Hill, and continued to the Monongahela River. Many trade and visitor-serving businesses sprung up around the canal's loading and unloading basins and near its terminal in the Strip District. Pittsburgh faced numerous disasters during the Commercial Period, including floods and fires. Pittsburgh's Great Fire of 1845 destroyed approximately two-thirds of the Downtown. These events caused citizens to rethink where buildings should be placed and how they should protect development from natural and human-caused disaster. Burke Building (Fourth Avenue, Downtown), dating 1836, is one of the few buildings that survived the Great Fire of 1845. By the mid 19th century, Pittsburgh was one of the largest cities west of the Allegheny Mountains. Known as a manufacturing and commercial giant, industries attracted workers to fill jobs in mills, shipyards, and coalfields. The City experienced a population explosion. The number of residents doubled from approximately 21,100 in 1840 to 46,600 in 1850. Then, between 1850 and 1860, the population tripled to about 156,000. At that time, European immigrants accounted for approximately one-third of the area's population. Deutschtown (East Allegheny; 1890-1910) was home to a mostly German, and then Croatian, population. Its commercial district contains three-story Victorian buildings. Several of Pittsburgh's National Register and City-Designated Historic Districts developed in the late 19th and early 20th centuries. The cultural influences and socio-economic positions of their occupants strongly influenced architectural styles and building types. Ethnic groups settled together and built neighborhoods around the customs, religions, and traditions of their homelands. City of Pittsburgh, PA, Preserve PGH: preserving the character of Pittsburgh and its neighborhoods, 2012, www.pittsburghpa.gov, accessed June, 2015.